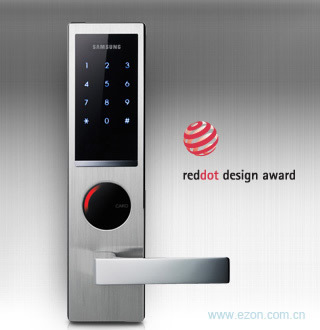 The Samsung Door Lock (shs-h635) is the world's first winner of the Reddot Design Award, which is the most prestigious design award in the world. The product adopts high quality LED and upgrades the user interface that shows operational processes of the door. 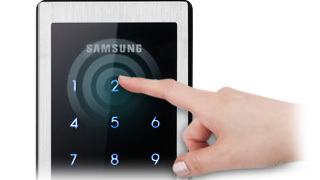 Normally, the numbers on the number pad are not visible, but when a user touches the door lock number pad with his/her palm, the numbers appear in the backlight. 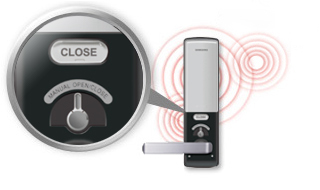 This touch sensor feature minimizes the risk of number exposure. The product enhances security by adopting a Safe Grip feature; it prevents unauthorized intrusion attempts by enabling the pressing of buttons and turning the handle while going out through the door. 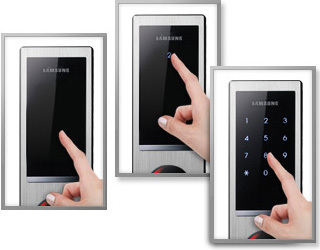 With a metallic, high-quality black touch screen, the key pad cover can be utilized easily without having to open it. With the Magic Number double security system, homeowners can feel extra safe that passwords will never be exposed. After pressing enter, utilizing a two digit random number input system before inputting one's pre-determined password increases security and safety. Having surpassed many tests including withstanding high-voltage electric surges, simulated theft scenarios, and fire with impressive results, one's security is guaranteed with high quality, and innovative technology. In the case of a fire, and when temperatures reach over 60 degrees Celsius, the system is specifically designed to sound off the alarm and unlock the door thereby allowing the user to manually open the door using the lever in case the lock loses its electronic functions. When the door lock is functioning properly, a red LED light at the center of the door lock blinks in a circular pattern to signal to the owner its fully operational status. 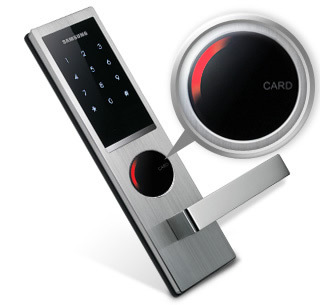 In addition, password input and door opening sounds can be easily adjusted to suit one's environmental needs. With a slim metallic and black design, the casing gives the door lock a modern and sophisticated look. 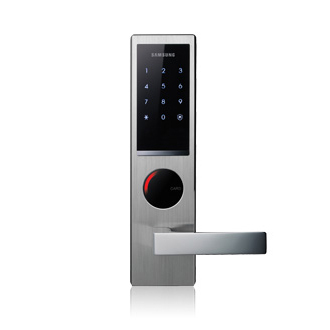 Ergonomically designed for the user's ease of use, the Samsung Smart Door Lock received the three top design accolades including the Red-dot Design Award.